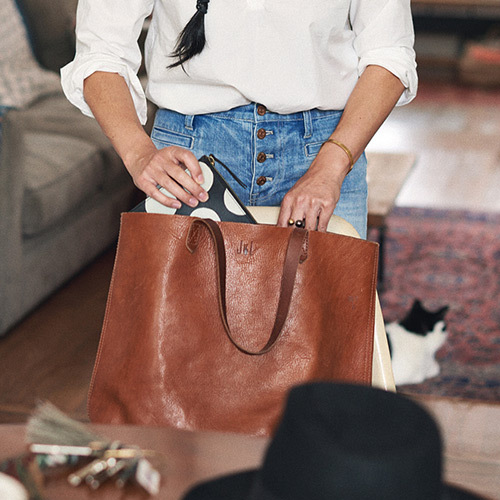 What goes into the drawstring version of our Transport Crossbody? Here it is by the numbers: 2 pieces of fine leather are used for the body. 2 ways to carry: with the top handles or the detachable shoulder strap. 2 for 1: cinch it closed to transform it into a mini bucket bag. 2 interior side pockets—perfect for your phone, train pass, whatever. 3: the number of hours it'll hang with you at a concert. How often you'll reach for this one? 500 gazillion times. 7 7/8"H x 10"W x 2 5/8"D.